Meet the maniac and his friend. 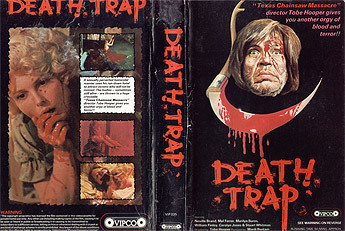 RELEASED IN THE UK under the title "Death Trap" Tobe Hooper's second film was a pack leader in the race to top the inafmous Video Nasties list in the 1980s. Primarily, but not exclusively, because of it's distinct and shocking box art. The movie itself - a twisted tale about a motel proprietor killing his guests and feeding them to a giant crocodile (not alligator!) - is a dark, insane, gruelling experience, but entertaining non the less. The crazy guy, an old redneck called Judd, is played effectively by Neville Brand (primarily because the actor was pretty much crazy in real life - according the the DVD extras). Judd's victims range from the stunning scream queen Marilyn Burns (appearing here in her second Hooper picture), to little kids - even taking in (out?) an early appearence from Robert (Freddie Kruger) Englund, who meets a ridiculous death at the hands of the titular crocodile. The croc is by far the least effective element of Eaten Alive - it's frankly shite - but the sum of the parts are greater than the whole in this case, and Tobe Hooper and his crew manage to stitch together a tale worth watching by coaxing some good performances out of the eclectic cast. Overall, Eaten Alive is a true grindhouse classic and features some superb, entertaining and bloody set pieces. The grating, eerie soundtrack contributes fully to the demented atmosphere, as does the unique lighting, which features strong reds and blues in a kind of comic book style. A must have title in any horror film fan's collection. This 'lost' splatter classic is a weirdo film-and-a-half. The bizarre 'country' soundtrack creates a maddening tone to the picture - not only does it make your fillings falls out, but it also seems to distort time. Never has a 90 minute film ever felt so long. Which is a compliment in this case! Shot entirely on studio sound stages Eaten Alive retains a grim and unhinged claustrophobia reeking of bayou inhospitality. Reviled by many but to this viewer a worthy follow up from Hooper to his Chainsaw classic. Neville Brand reportedly had a drink problem when they filmed this - talk about method acting (or casting to type)! 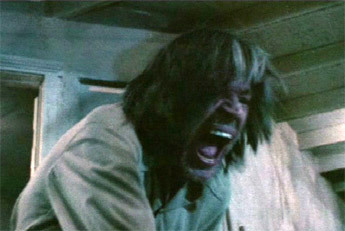 The man is like a beast possessed in Eaten Alive and takes the 'crazy man' role about as far as you can go in a film of this type. Never really been a big fan of this film - it gives me a bloody headache! And who made that bleeding crocodile? It's the worst movie monster ever made! Yes, the atmosphere is interesting, but what's the point if the main beastie is about as scary as a Teletubby? !